Head of state: Queen Elizabeth II, represented by a Governor-General. 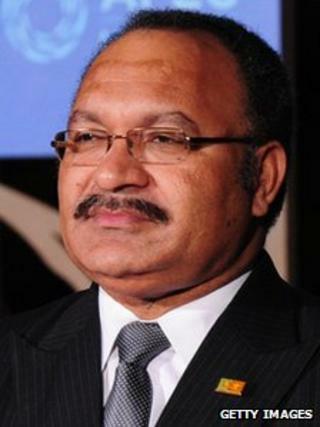 Parliament endorsed Peter O'Neill as prime minister in August 2012, finally drawing the line under a prolonged power struggle with his rival Sir Michael Somare, the founding father of independent Papua New Guinea. Prior to national elections in June 2012, both men had declared themselves to be the rightful prime minister. Mr O'Neill was first chosen by parliament to be acting Prime Minister in August 2011 after Sir Michael, who had by then been absent from the house for several months due to illness, was declared to be no longer eligible. Sir Michael subsequently challenged this decision and the rivalry between the two men developed into a standoff between lawmakers, the overwhelming majority of whom continued to back Mr O'Neill, and the Supreme Court, which ruled that Mr O'Neill's election was illegal and that Sir Michael should be reinstated. After Transparency International ranked Papua New Guinea one of the most corrupt countries in the world in 2012, Mr O'Neill declared that his government's priority would be to crack down on corruption. One of his first acts after being sworn in as prime minister in August 2012 was to approve the formation of a new anti-corruption task force as part of efforts to win the confidence of potential foreign investors. However, in June 2014 Mr O'Neill was himself accused of fraud by the national anti-corruption watchdog, which issued a warrant for his arrest. He has challenged the warrant in court and it has so far not been carried out. In November, Mr O'Neill was referred to a tribunal of judges over separate allegations of misconduct in office relating to a $1.3 billion loan. The hearing is scheduled for January 2015. Born in the Southern Highlands Province in 1965, Mr O'Neill was a businessman before being elected to parliament in 2002. Two years later, he became leader of the opposition before crossing the floor in 2007 to join Sir Michael Somare's government as finance, treasury and works minister.